By using a combination of virtual assistants and AI in place of manpower, the construction industry can save money and time. Artificial intelligence, also referred to as AI, has come a long way in terms of becoming an efficient and effective tool for a variety of workplaces. Armed with complex algorithms and features that allow machines to display their own type of understanding and problem solving, artificial intelligence has also been incorporated into the construction process. AI has applications for data-collecting and planning, and can help with the creation of construction plans. It can aid with the management of a project, offering solutions based on a historical database of knowledge. It can even be utilised to help with physical tasks. For the construction industry, artificial intelligence has come along in leaps and bounds, both as a solid tooling option and as a management support. Oasys, who work in building design software, explore some of the key areas that artificial intelligence has impacted the construction industry, from stage one through to demolition. In the construction sector, artificial intelligence is most often used across four main areas. These stages cover planning and design, administrative management, construction methodology, and post-construction. Construction plans can be created quickly by implementing artificial intelligence. Autonomous equipment is considered to be a form of artificial intelligence as it is aware of its surroundings. It is also capable of navigation without human input, meaning it can work alone without an operator or driver. In the planning stages, AI machinery can survey a proposed construction site and gather enough information to create a multitude of planning assists, such as 3D maps, blueprints and construction plans. Traditional processes to gather the same sort of information in the past could be lengthy. Additionally, the information may not have been as accurate as the information artificial intelligence supplies to us today. The machines used to complete this work now can typically do so in a single day, rather than weeks. This helps to save firms time and money in labour costs. Artificial intelligence can also be applied once construction has moved past the planning stages and the actual building process begins. Various programs and software can be used to manage projects and control specific tasks within a project. For example, workers can input sick days or sudden departures. Vacancies for job posts can also be entered. With this information gathered, the system can build a database and use that knowledge to adapt the projects as needed. The artificial intelligence of the system will understand whether or not a task needs to be moved and reassigned, such as when a worker if off sick. Best of all the software will do this of its own accord. With a wealth of information gathered and stored in its database knowledge, artificial intelligence can support engineers by informing them of how projects should be completed. The software can not only inform a process, but suggest processes based off its understanding of previous data of similar projects. For example, if engineers were working on a proposed new bridge, AI systems would be able to advise and present a case for the best method to construct the bridge. It would base this answer on past projects from the last 50 years of work, as well as cross referencing with pre-existing blueprints and maps for the design and implementation stages of the project. By having this information to hand, as well as having it cross-checked in real time against previously gathered information, engineers can make crucial decisions based on the evidence that they may not have had previously at their disposal. In addition to working alongside engineers, machines can also use artificial intelligence to work independently of engineers and drivers. Drivers can now remain outside of a vehicle or machine as it works on its own at a dangerous or risky height. Be it a commercial or domestic project, after it has been completed, artificial intelligence is frequently integrated into the live structure in the form of various software and hardware. In the United States alone, $1.5 billion was invested in 2016 by companies who were looking to capitalise on the growing market of AI upgrades to their buildings. Back in 2016, the Wynn hotel chain declared that it would be installing Amazing Echo software in to each one of its rooms in its Las Vegas hotel by the end of 2017. These devices can be used from the comfort of the room to control various aspects such as lighting, temperature, and any kind of audio-visual equipment contained in the room. These systems can also be installed in a domestic setting; with such artificial intelligence systems already on the rise within homes. The use of BIM, building information modelling, can implement artificial intelligence to store information and historical data about a building from the initial planning stages, through all of its managerial decisions as it is being constructed, to its unveiling, its use, and finally, until its demolition. This information can be found, sorted, and delivered by a Virtual assistant (VA). By combining the use of VAs alongside NFC (near-field communication), VAs can be given additional information about the building itself in real-time from sensors located throughout the building. For example, if structural problems began to develop in the building, the VAs would be able to inform engineers, and more specifically, about where the problems are situated. With the use of previously mentioned AI, the VAs are also able to advise about the best method for fixing the issue. 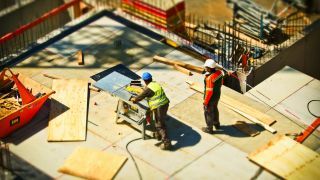 The construction industry can save money and time by making use of a combination of VAs and AI in place of manpower. As the future of artificial intelligence becomes more of a reality within construction, only time will tell how reliant upon intelligent machines we will have to be in order to construct innovative building designs. Time will also tell how far artificial intelligence will push innovation to new levels, and what construction processes may be made possible through AI's continued evolution.